What I'm Currently Thinking - Special Thanks to Anchored in 3rd! - HAPPINESS IS WATERMELON SHAPED! What I'm Currently Thinking - Special Thanks to Anchored in 3rd! I have to say that I am extremely lucky to have found such a helpful blogger. I follow this blog: http://www.anchoredin3rd.blogspot.com/ I love this blog because the author writes authentically and creatively. Plus she (Autumn) is always doing these "linky parties." I'm not 100% sure what all this means, but I think that bloggers share their ideas on a certain topic. (Please feel free to correct me and/or add to my perceptions.) 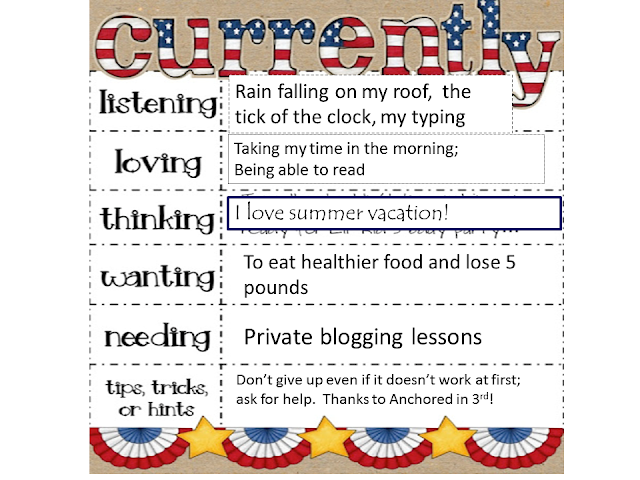 Any way, I saw this adorable Fourth of July themed Currently Chart in which Autumn shared her thoughts, and I just wanted to try it out so I wrote to her, and she told me what to do. Now, that is just amazingly kind and helpful; and I'm feeling very grateful. As you can tell, I still need to practice inputting my own information, but I'm going to keep trying. 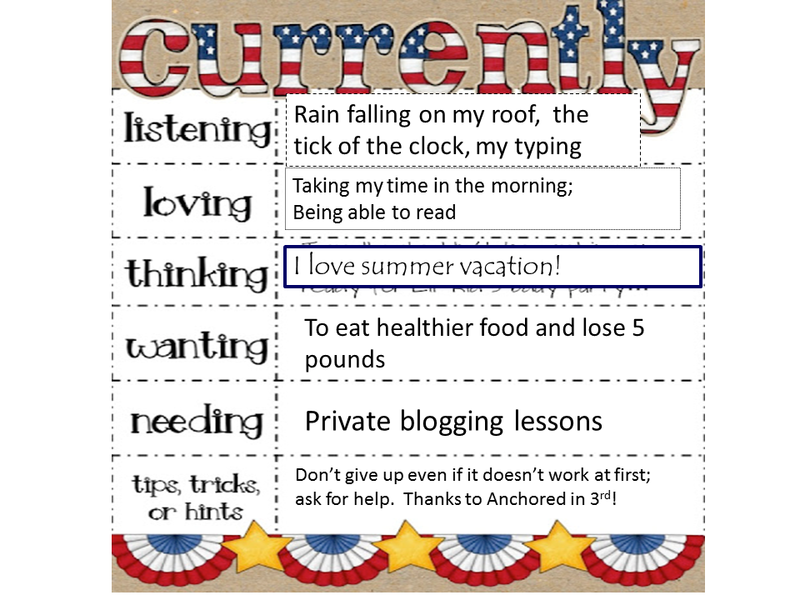 By the way, Autumn got this template from http://ohboy3rdgrade.blogspot.com/Farley which is a new blog to me, but I'm liking it so far! Wow - an old dog can learn new tricks!